What Do an Island and the Letter 'T' Have in Common? 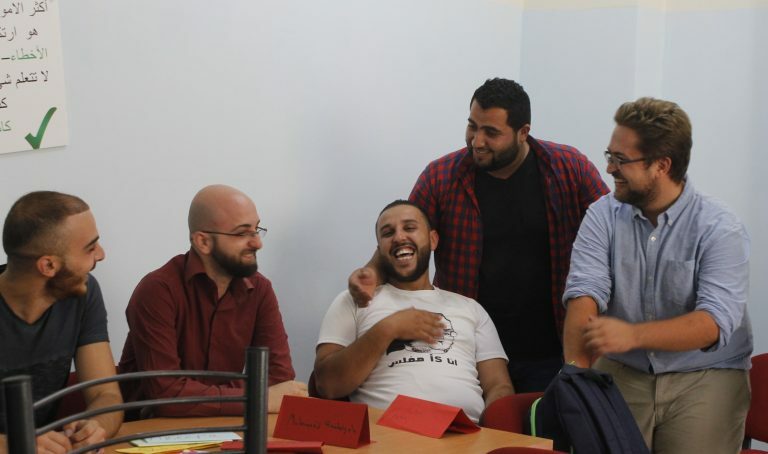 EFL Fellow Mike and his students share a laugh during a STEP! II EFL class. People often say that jokes are the most difficult thing to translate. While this can sometimes be true, joking can actually transcend language barriers. It’s also a good way to trick people into learning a language. Comedy is a great way to learn a language, or really anything for that matter. While the students of my STEP! II EFL class knew Great Britain, Ireland, and other English speaking countries have different dialects, they were entirely unaware that different parts of the United States have different accents.Learning about different American accents was an enormously successful activity in my class and the students absolutely had a blast. Coming from Rhode Island, I can put on a fairly decent Boston accent. The giggling that followed my rendition of “pahk the cah in Havad Yahd” could have filled a stadium. However, while the students were definitely enjoying themselves, they were learning important vocabulary at the same time and getting exposure to how English speakers in the real world actually speak. It can be intimidating to listen to native speakers. We speak quickly and without any regard to how difficult we are to understand. But if the person has a funny voice and the students can laugh as they listen, they open up more. Before I knew it, we were reviewing the transcripts of these listening files and everyone was furiously writing down all of this new vocabulary. If I had only handed out worksheets with lists of vocabulary, I imagine I would have found many of them crumpled in the garbage. As their teacher, I have been trying to focus on vocabulary that the students can really use in their day-to-day life. Given the amount of English media they all consume, they desperately want to speak like Americans. A sentiment I understand, given how badly as I want to speak Arabic like a Palestinian. As non-native speakers of English, my students obviously speak with a Palestinian accent. I felt their comfort level increase as they came to realize that every speaker of English sounds different. There is no ‘right’ way to speak English. Your grammar can be incorrect, you can mispronounce a word, and those are real mistakes, but you can never ‘fail’ at English. Some of the ‘mistakes’ EFL learners make are not so different from the ‘mistakes’ made by native English speakers. To me, these kinds of exercises are the most important part of language learning. Not only did my class get excited about the English, but also developed a level of comfort with each other and with me as their teacher. If we, as a class, can gently tease the pronunciation of someone, like myself, with a slight New England accent, then how can any student feel bad mispronouncing a sound? Or misspelling a word? I’m looking forward to joking around more with my class and I’ve definitely felt us getting closer as a group. Now, after the second week, there is a line of five or six students waiting to ask me questions. I feel very strongly that my openness and willingness to joke with them makes the entire classroom a more comfortable setting. Inshallah, this can continue and my students won’t tire of my corny sense of humor! P.S. The answer to the riddle is: They are both in the middle of ‘water.’ Thankfully my students found that more funny than my fellow teachers did.